Strawberry Begonias are small, low growing, evergreen perennials that spread by runners called stolons, just like a Strawberry plant does. They have rounded, coarsely toothed, green leaves with silver marbling and covered with a fine hair, and having reddish undersides that form a loose rosette. 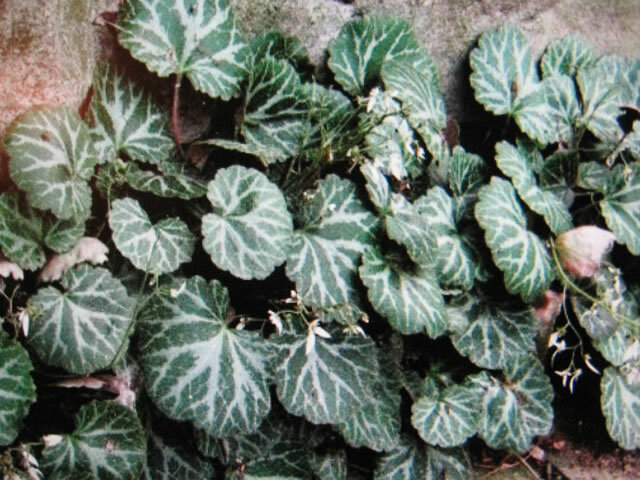 The variety, 'Tricolor' has attractive, red and cream colored variegated leaves with silvery veins. In late spring to summer, they produce 12"-18" tall panicles of tiny, white, star shaped flowers. Strawberry Begonias are excellent as ground cover plants, for planting in rock gardens or containers, and for filling cracks and crevices. They also make wonderful, hanging house plants! 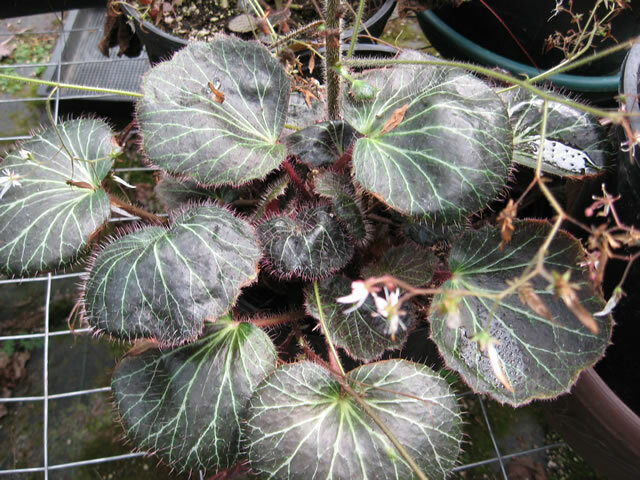 Saxifraga stolonifera is also commonly known as Rockfoil, Strawberry Geranium and Mother of Thousands. The botanical name, Saxifraga, is derived from Latin words 'saxum', meaning rock, and 'frango', meaning break. This alludes to the fact that in nature they are often found in mountainous regions, growing in the cracks between rocks. Saxifraga stolonifera are hardy in USDA zones 6-9. Strawberry Begonias grow best in light to partial shade. They prefer cool climates and resent extreme changes in temperature. Growing them next to your house or other large structures will help to moderate any extremes. that has been enriched with compost at planting time. Water regularly and thoroughly, and feed monthly will a good all-purpose soluble fertilizer while your Strawberry Begonia is actively growing. Never allow water to pool around the crown of the plant. Avoid planting too close to taller plants which will compete for nutrients. Keep the surrounding soil free of debris if you want the offsets to take root. to cascade down, exhibiting their strings of offsets and their tiny blooms in the springtime. They can be grown in terrarium environments or as a covering for topiaries as well. Plant your Strawberry Begonia in any good, indoor potting mix. when the plant should be kept in a cool room and allowed to dry out before watering. Place the plant where it will get bright, indirect light. Direct sunlight will cause leaf colors to fade. Strawberry Begonias appreciate added humidity during the winter months, especially in electrically heated homes. Crispy edged, shriveled leaves are a sign that the air is too dry. This can be resolved by setting the plants on shallow trays filled with moistened pebbles. Strawberry Begonia plants should not be misted, as this may cause the leaves to rot. Maintain an average room temperature of 50°-75° during the growing season, but slightly cooler in the winter months. Feed monthly in the spring and summer with a half strength solution of a balanced, soluble, house plant fertilizer. Strawberry Begonias are susceptible to attacks from spider mites. Strawberry Begonia Plants are extremely easy to propagate from runners. Leaving the runners attached to the parent plant, pin the plantlets down (a bent paper clip works well) onto moistened planting mix in small pots set adjacent to the main plant. The plantlets will form roots in 3-4 weeks, after which you can sever the runners and you'll have a new plant. Seeds can be sown indoors during any season. Maintain a temperature of 65°-75° within the growing medium until germination, which takes 15-20 days.